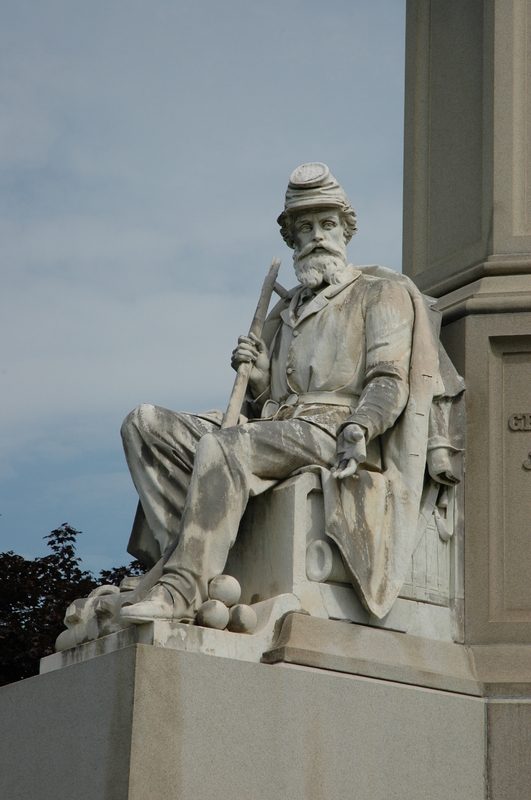 Detail of the Soldiers National Monument at Gettysburg’s National Cemetery (Tom Huntington). Yesterday marked the 150th anniversary of the battle of Gettysburg’s third and final day. The fighting here in 1863 had been fierce and bloody, with something like 8,000 dead from both sides. Most of the fallen were initially buried near where they died. Many of the Union troops were eventually laid to rest in the new National Cemetery, site of President Lincoln’s address on November 19, 1863. General Meade was invited to the cemetery dedication but had business with General Lee in Virginia at the time. On July 1, 1869, he returned to Gettysburg to speak at the dedication ceremonies for the Soldiers’ National Monument in the National Cemetery. It was, for its time, a short speech so I have posted the entire address here. Especially interesting are Meade’s remarks about the Confederate dead at Gettysburg. Six years ago I stood upon this ground under circumstances very different from those which now surround us. These beautiful hills and valleys, teeming with luxuriant crops, these happy faces around me, are widely different from the tumultuous roar of war and the terrible scenes enacted at that time. Four years ago I stood here, by invitation of some honorable gentlemen who have brought me here this time, and laid the corner-stone of the Monument which we are brought here to-day to dedicate; and now, for the third time, I appear before you at the request of the managers of the Monument Association, to render my assistance, humble as it is, in paying respect to the memory of the brave men who fell here, by dedicating this Monument to them; and at the request of these gentlemen I am about to make to you a few, a very few remarks which are incident to this occasion and suggested by it. When I look around and see, as I now see, so many brave men who were by my side in that memorable battle, among them his Excellency the present Governor of Pennsylvania, General Geary, and others who were with me at that time; when I look back and think upon the noble spirits who then fought so well, and now sleep that sleep that knows no waking—gallant Reynolds, my bosom friend, as well as my right hand officer; brave Vincent, and Zook, and Weed, and others, far more in number than I have time of words to mention,—my feelings are those of mingled sadness and joy,—sadness, my friends, to think that there ever was an occasion when such men should be arrayed in battle, as they were here; that we should ever have been called upon, as we were upon this held, to defend the flag of our country and Government, which had been handed down to us from our forefathers. It is sad to think of the mourning and desolation which prostrated our whole land, North and South; it is sad to contemplate the vast destruction of life which we here wrought in obedience to our highest duty. I am filled with sadness to think of the host of mourning widows and orphans left throughout the land by that deadly struggle. Such thoughts necessarily crowd upon us. At the same time I give thanks to the Almighty, who directed the event, and who selected me as an humble instrument, with those then around me upon this field, to obtain that decisive victory which turned the tide of that great war, and settled for ever the trust in this country of the great principles of personal liberty and constitutional freedom. I feel grateful, too, that our fellow-countrymen have been moved to such respect and honor as we are now paying to the memory of those men who, in the discharge of their duty, laid down their lives, proving, by the highest sacrifice man can render, their devotion to the cause they were defending. Gratitude to those present to-day, who, by their presence, contribute to render the high honor justly due to the fallen brave. There is one subject, my friends, which I will mention now and on this spot, while my attention is being called to it, and on which I trust my feeble voice will have some influence. When I contemplate this field, I see here and there the marks of hastily dug trenches in which repose the dead against whom we fought. They are the work of my brothers in arms the day after the battle. Above them a bit of plank indicates simply that these remains of the fallen were hurriedly laid there by soldiers who met them in battle. Why should we not collect them in some suitable place! I do not ask that a monument be erected over them; I do not ask that we should in any way endorse their cause or their conduct, or entertain other than feelings of condemnation for their course: but they are dead! They have gone before their Maker to be judged. In all civilized countries it is the usage to bury the dead with decency and respect, and even to fallen enemies respectful burial is accorded in death. I earnestly hope that this suggestion may have some influence throughout our broad land, for this is only one of a hundred crowded battle fields. Some persons may be designated by the Government to collect these neglected bones and bury them without commemorating monuments, simply indicating that below sleep misguided men who fell in battle for a cause over which we triumphed. I shall delay you no longer, for you are about to listen to one of the most eloquent men in this country. My purpose was simply to comply with the kind invitation given me to speak meet words of praise for the dead heroes sleeping around, and to aid in the solemnities of this occasion. I thank you for your attention, and will now unveil the statue. From The Soldiers’ National Cemetery at Gettysburg: With the Proceedings at its Consecration, at the Laying of the Corner-stone of the Monument, and at its Dedication by John Russell Bartlett (Printed by the Providence Press Co. for the Board of Commissioners of the Soldiers’ National Cemetery, 1874). Available via Google Books.